Two Sisters Share One's Road To Recovery : Shots - Health News When Shirlene English was immobilized by a stroke in 2000, her sister Loretta stepped up as chief caregiver. Then Loretta's father developed dementia, and she stepped up again. Four generations live under one roof in the Jackson household in Sacramento, Calif. — 46-year-old Loretta and her husband, her daughters and granddaughter, her sister and her 71-year-old father. There are a lot of breakfasts to prepare, and Loretta usually starts the laundry and other chores at about 6 in the morning. Part of her daily routine is working with Shirlene, Loretta's 51-year-old sister, who suffered a stroke in 2000 that left her partially paralyzed and unable to speak. "She couldn't say nothing," Loretta says. "Nothing at all." 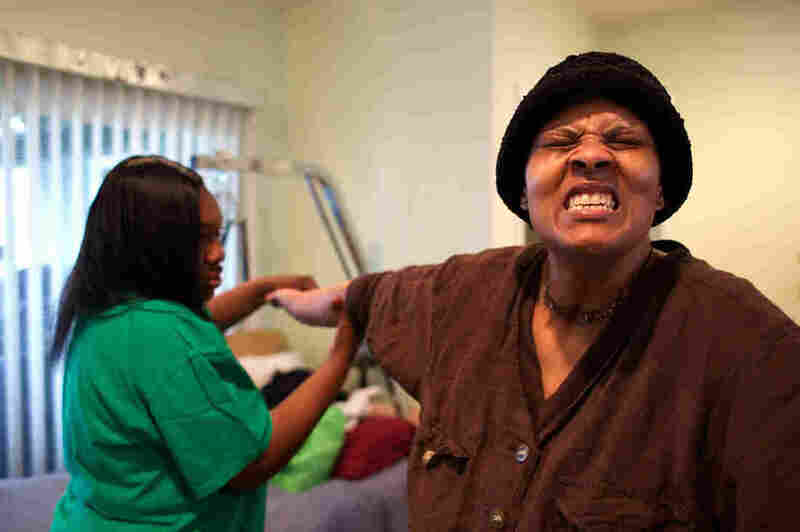 The doctors and therapists didn't give Shirlene very good odds for recovery. "They said, 'Well, we've pretty much done all we can do. It's not going to come back,' " says Loretta. That didn't stop her from trying to help her sister heal. We are taking care of the most vulnerable in our society — aging adults who have chronic care needs — by placing the burden on the backs of some of the people who can least afford it. Loretta and Shirlene grew up in Hope, Ark., in a family of six siblings. Loretta felt "stuck" in Arkansas, and moved to California in the 1990s. But she went back for Shirlene after the aneurysm, and brought her into her home, even leaving her job to care for her sister full time. She and her husband, Milton, built a new bedroom and bathroom onto the back of their home, where Shirlene now spends much of her day. Every morning, after breakfast, with the morning game shows running on her TV, Loretta and Shirlene work on a daily routine of physical and speech therapy. Shirlene practices writing (left-handed now) and pronouncing several useful words — like "apple" and "buttons" — that she keeps nearby on a paper list. Loretta massages and stretches Shirlene's legs to improve her circulation. She flexes and rubs her hands and arms, particularly the right hand, which when left alone will twist itself into a knot. And slowly but steadily, as Loretta improvised these therapies with her sister, Shirlene's ability to move came back. She has learned to stand and move around slowly with a cane. She can now tie her shoes, and even sew with her left hand and teeth. She can also write a little, and has regained a bit more of her ability to speak. 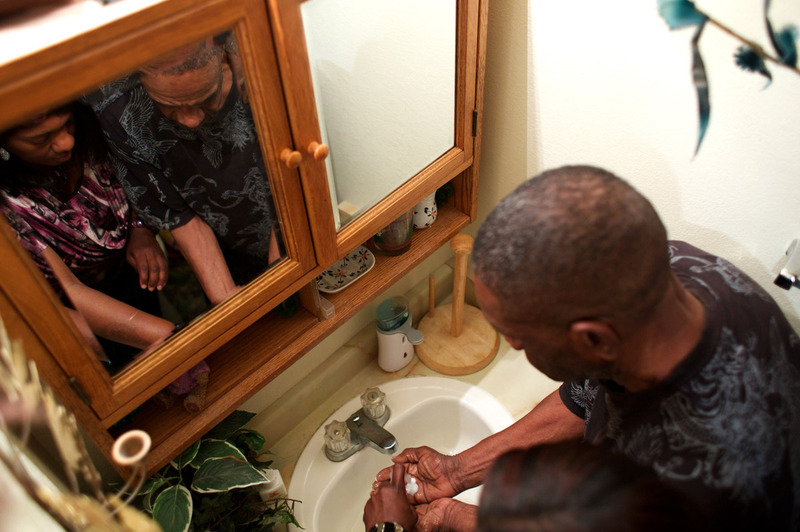 Loretta Jackson shows her father, Theodis Turner, how to wash his hands. Theodis has dementia and lives with the Jacksons. Loretta Jackson also provides around-the-clock care to her father, Theodis Turner, who came to live with the family five years ago, after he was diagnosed with dementia. His symptoms can make him erratic at times, and even routine things, like bath time, can become a struggle. "You have those days where he'll say, 'OK, I'm in the tub!' and he'll get in fully dressed," Lorretta says. "And if he gets in fully dressed you've got to try to get his clothes off. He won't get out of the tub." You have those days where he'll say, 'OK I'm in the tub!' and he'll get in fully dressed. And if he gets in fully dressed you've got to try to get his clothes off. He won't get out of the tub. Geoff Hoffman, with the UCLA Fielding School of Public Health, says Loretta Jackson's experience is emblematic of the struggles of the "sandwich generation" of caregivers — people who are squeezed between balancing the needs and demands of aging parents and their own children or, in Loretta's case, a disabled sister. "The experience for these caregivers is quite burdensome, emotionally and physically," Hoffman says. The work these family caregivers are doing would be enormously expensive if their loved ones were instead in nursing homes or other institutions, Hoffman says. But the caregivers also often find they must cut their hours at work or, as in Loretta's case, give up outside jobs in order to care for their relatives. "In effect," Hoffman says, "we are taking care of the most vulnerable in our society — aging adults who have chronic care needs — by placing the burden on the backs of some of the people who can least afford to do ... those who are themselves economically fragile and vulnerable." In California, Loretta's dad and sister get assistance from the state, which allows them to pay Loretta about $11 an hour to work as their caregiver. But the state Legislature is considering changes to the program that could limit her hours and reduce that income. The burden is not just financial. Loretta Jackson says the daily grind of running a household and providing care to her sister and dad can sometimes take its toll on her health too. 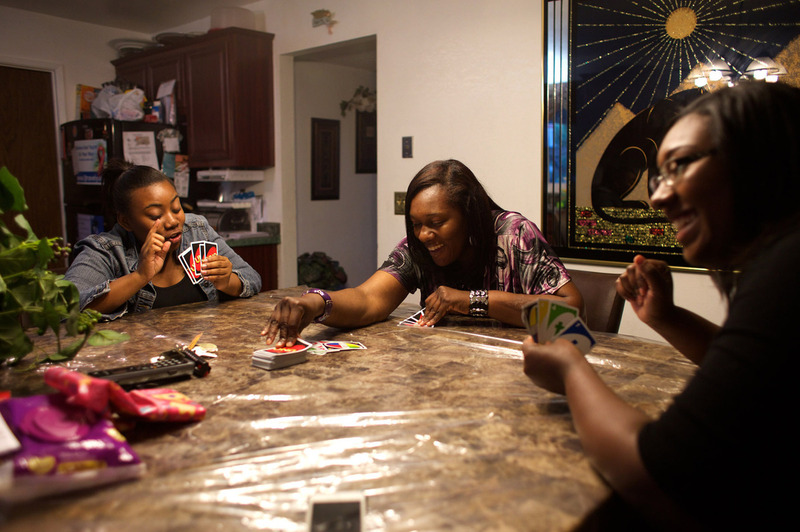 Loretta Jackson (center) plays a card game with her daughters Onasha Mitchell and Johkida Jackson on a Friday evening at home. "Some days I sit down and I can't move," Loretta says. "It's like my body just will go into a spasm. Then I go to the doctor and she will say, 'Well, we can't find anything. You're OK, maybe you were just over-tired or over-exhausted.' Maybe so, but I couldn't move. I couldn't do anything." Loretta also worries about how her family would get by if anything happened to her. "I am their backbone," she says. "If I go down, and I can't provide for them, and I don't have anyone that can step in, they probably would go down as well. Or have to be placed [in a nursing home or other facility]. And I'm praying that never has to happen. Loretta and Shirlene likely have many years ahead of them — together. It won't be easy, but what keeps Loretta going is her belief that one day Shirlene will be able to more easily walk and talk again. You can hear and read much more about the struggles Loretta Jackson and other family caregivers face, in KXJZ Capital Public Radio's documentary series Who Cares.